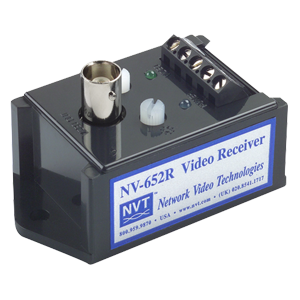 The NVT Model NV-652R Video Receiver is an active (amplified) device that allows the transmission of real-time monochrome or color video on up to 1 mile (1,6km) using Category 2 or better Unshielded Twisted-Pair (UTP) telephone wire. The unparalleled interference rejection and low emissions of the Model NV-652R allow long run video signals to co-exist in the same wire bundle as telephone, datacom, or low-voltage power circuits. This allows the use of shared or existing cable plant. Ground-lifting ensures no annoying “hum-bars” when ground potential differences exist. With built-in transient protection, damaging voltage spike problems are eliminated. The built-in sharpness and brightness controls compensate for cable loss. View Tech Specs The NV-RM8/10 Rack Panel allows for the rack mounting of up to ten single-port transceivers, such as the NV-213A, NV-652R, or NV-653T. Alternately, it can support up to two four-port devices, such as the NV-413A, NV-452R, or NV-704J-PVD. The NV-RM 8/10 can reside on front or rear rails in the same rack as NVT hubs, multiplexers, DVRs, or encoders. This heavy gauge panel is designed to withstand the mechanical load of multiple coax cables. Threaded holes and screws (included) provide easy transceiver mounting, and installation into a 19” rack.